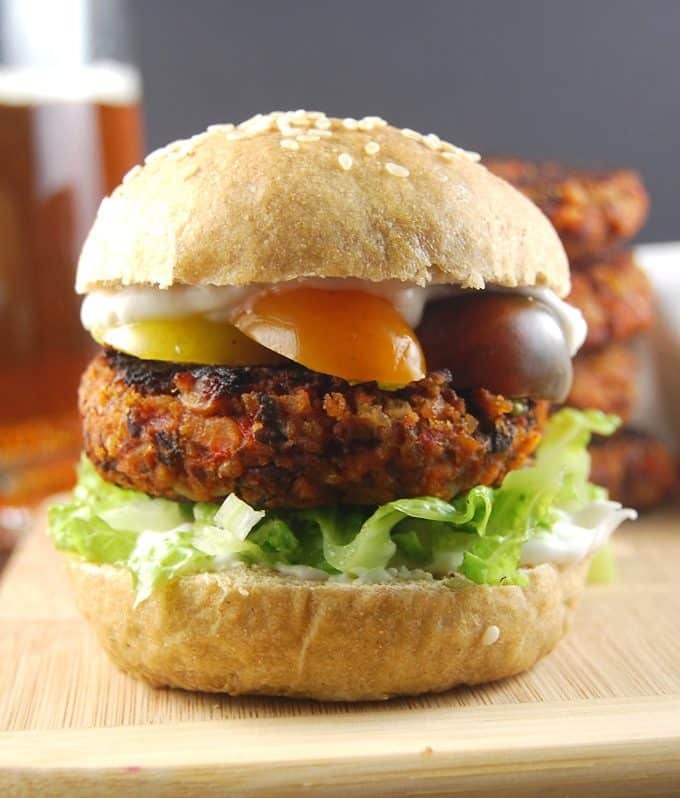 What’s not to love in this flavorful, delicious and beautifully textured Kidney Bean and Roasted Red Pepper Burger. 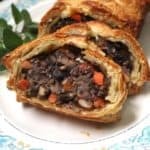 It is hefty with tempeh, beans, brown rice, and toasted almonds, and the roasted red peppers and cumin add a rich smokiness you’ll love. 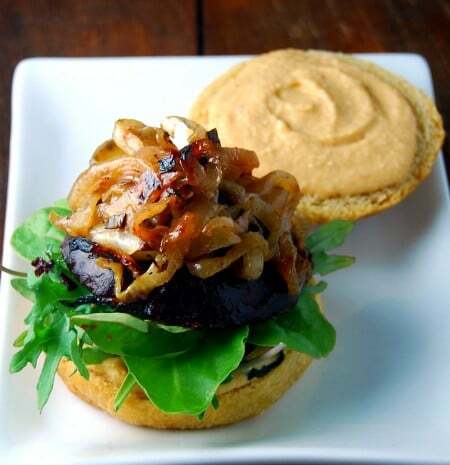 The burger patty is vegan and gluten-free. 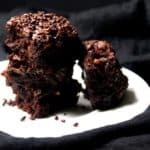 This is an updated version of a recipe I first posted in April 2016. 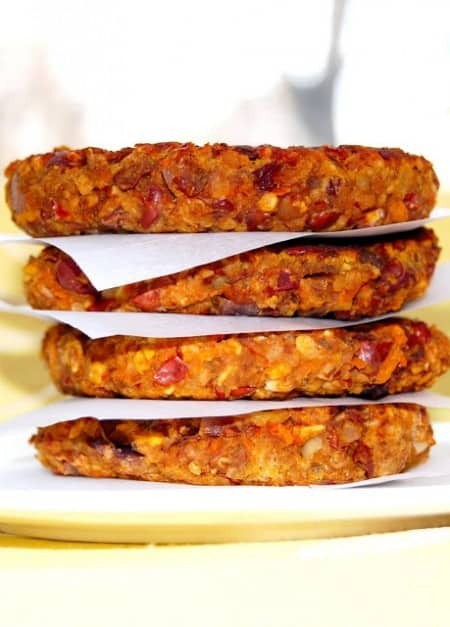 Here’s yet another extremely grillable veggie burger that’s going to become one of your summer favorites: my Red Bean and Roasted Red Pepper Burger mixed up with all sorts of insanely delicious things, like brown rice, roasted almonds, roasted mushrooms, and tempeh. Here at Holy Cow! I’ve been sharing burgers with you each summer (and sometimes winter, because is there really a time when you would say no to a burger?). 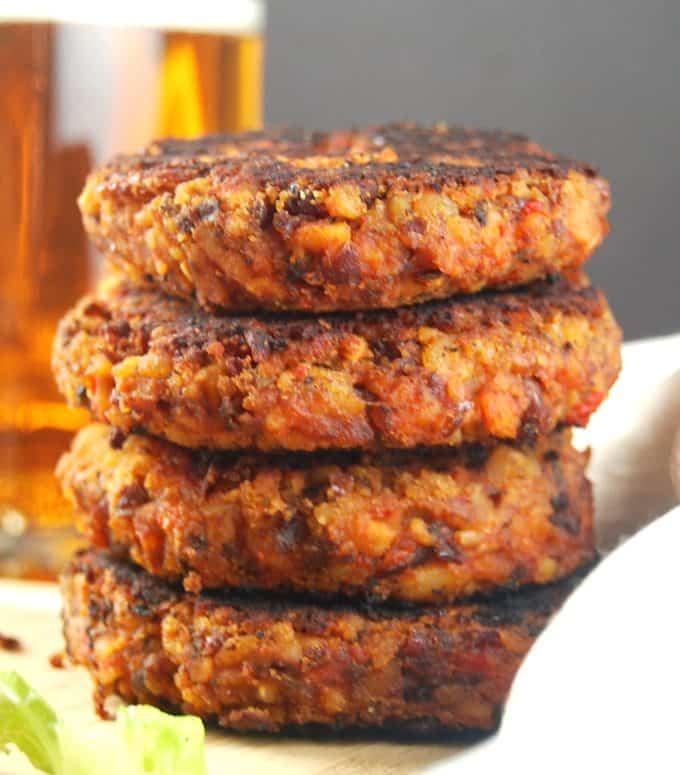 I’ve created quite a few that stand up beautifully on the grill, like my Bean and Oats Burger, my Quinoa and Bean Burger, and my Black Bean and Black Rice Burger. I am proud to add this incredibly flavorful burger to that hallowed group. There’s a lot here to love. The burger is smoky with the roasted red peppers, smoked paprika and cumin. Tamari and mushrooms add umami. 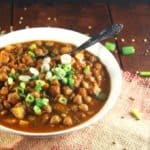 Tempeh, almonds and beans add meatiness and tons of protein. 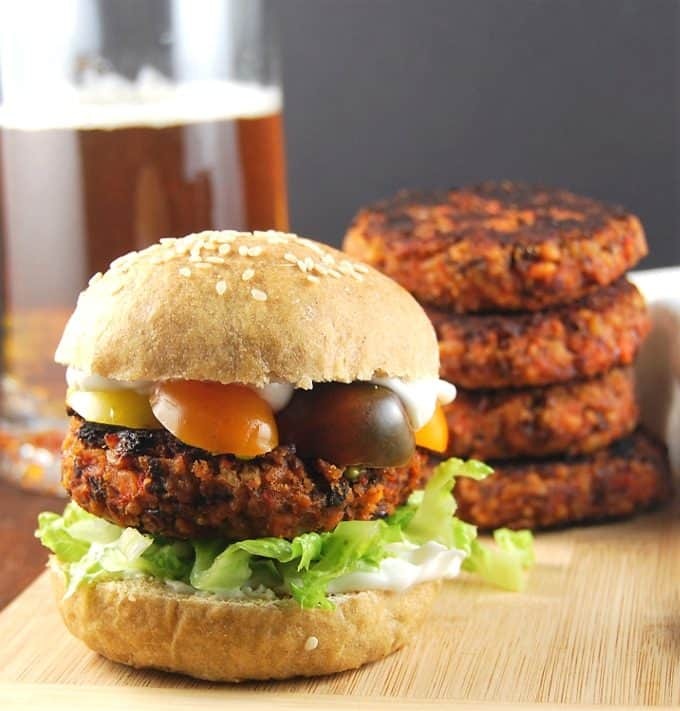 In fact, there is 13 grams of protein and more than 5 grams of fiber in each of these burgers. Because veggie burgers tend to get too mushy because of the high moisture content of beans and veggies that often go into these recipes, I roasted the beans and the mushrooms beforehand to extract as much moisture as possible. This is a little extra work, yet, but it’s well worth the trouble to produce flavorful patties that hold up well on the grill. 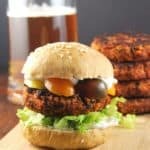 There are many flavorings that go into this grillable veggie burger, yes, but there are no hard and fast rules here. If you don’t have smoked paprika, leave it out. No rosemary? Try sage instead, or thyme. Flavor your burger as you go along, and let your tastebuds tell you what you need. You won’t go wrong. A very grillable, hefty and meaty veggie burger made with red beans, roasted red peppers, mushrooms, brown rice, almonds and tempeh. On a large baking sheet sprayed with oil or lined with parchment paper, toss the red beans with salt and pepper and spray lightly with some oil. Spread in a single layer on one side, leaving room for the mushrooms and tamari. Spread the mushrooms, also tossed with salt and pepper, in a single layer. Cut the tempeh into four pieces and place next to each other on the baking sheet. If your baking sheet is not large enough to hold all three, you can certainly use two and roast them together. In a preheated, 425-degree oven, roast the beans, mushroom and tempeh for 30 minutes. Set aside. In a food processor, process the almonds with the tamari until coarsely chopped. You don't want to reduce it to a paste, but you don't want very large pieces either. Add the onion powder, garlic powder, cumin, paprika, rosemary, mustard, and ketchup and mix. Add the red bell pepper, beans, mushrooms and brown rice. Pulse two or three times for five seconds each to mix. Crumble in the tempeh and either mix by hand or pulse briefly once or twice for two or three seconds to mix. Remove to a bowl and add salt if needed. Shape into eight, approximately two-and-a-half-inch burger patties. Refrigerate for an hour before grilling. Heat a skillet and spray or brush lightly with oil. Or fire up your grill and brush on some oil. Grill each patty for about four minutes on either side. Serve hot atop whole wheat buns with all the fixings. I am in love with cute, colorful cherry tomatoes of all colors to stack inside the burger. I marinate them about an hour before using in some apple cider vinegar, salt, and parsley. I have never ever thought of roasting beans! 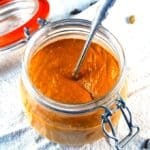 You say you did it to extract the moisture—but bet it also added even more delicious flavor (not that you don’t nail delicious flavor with your spicing skills!). Did you need to steam the tempeh first to remove the bitterness (I actually can eat some bitter stuff, like bitter gourd, but someshow I seem to like tempeh better when it’s steamed in the microwave for about five minutes). And marinating cherry tomatoes to put in it? Genius! I can’t believe you come up with all these special ways to tweak your cooking—-and after working all day and taking care of an active young son! This will be Memorial Day dinner (if I can hold out for another month!). A silly question—is the burger on the bun with the other stuff as tall as it looks (or is it just the photography)? It looks like six inches high—hard to eat, but I’d sure make the effort since I know it’s delicious! Thanks for your kind words! And I hope you will try this on Memorial Day! I think I will too. Another yum to eat, thank you! Making the buns now, and will have these tomorrow! You are amazing. That’s a neat trick! Tossing the beans alongside the veggies and tempeh. 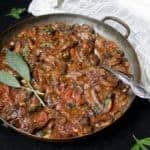 I’ll sub cauliflower for mushrooms, Wild it work just as well? 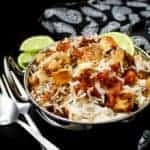 Hi Pallavi, cauliflower should work fine! 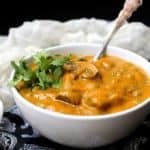 Hi Vaishali, thanks for the recipe. 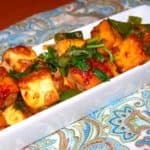 Can I substitute for tempeh? Never did learn to like it. Hi Marc, you can certainly leave it out or sub with baked tofu. I find many vegan/ veggie burger recipes I’ve made are always a little dry but this one stayed beautifully moist. I’ll be making again and again. 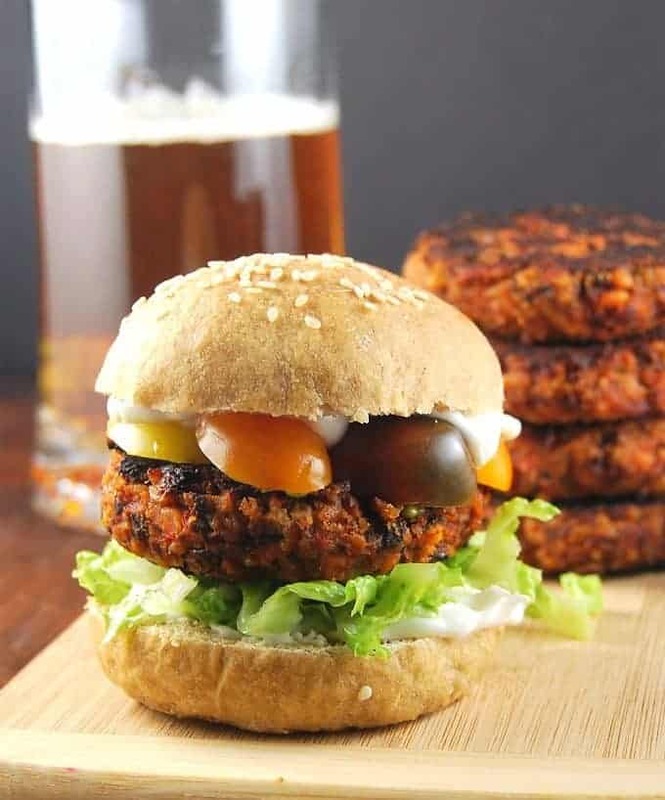 Vaishali that burger looks awesome, and what an amazing idea to roast the beans. Just one question- will it make a big difference if I leave out the onion and garlic. I abstain from it on certain days. My experience tells me that finely chopped cabbage works. Do you suggest any thing else? Or can it just be left out? 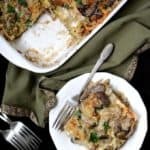 Changed 2 things in recipe. added organic panko crumbs.1/2 beaten organic egg and very finely chopped portobello mushroom… HATE Tempeh, or Tofu…No way. Am retiring now with health issues and have taken seriously into consideration what I eat and as always you are my go to for making eating bearable,interesting and just plain fun ! Hoping family is well and Jay is growing in all the best ways. He is very lucky to have parents like you and Desi. Regards to you all ! My whole family enjoyed these and only my daughter is a vegetarian. I didn’t have mushrooms but it didn’t seem to matter. I fried them in a pan and they kept together pretty well. Looks delicious. What can I use instead of brown rice? Would cooked quinoa /crackedwheat or millet work? Yes, cooked quinoa would work for sure!